UNTIL a two-week curriculum trip to Lyon, France, cooking ingredients never quite bothered culinary arts student Shaun Santokh Singh Gill. While in France, the experience of using fresh green peas from the pod and crisp carrots still caked in soil, rather than "frozen produce from a packet", gave the 21-year-old a fresh perspective on cooking. He and 18 other classmates from the Institute of Technical Education (ITE) visited famed cooking school Institut Paul Bocuse in Lyon for two weeks last month. His class is the pioneer batch in the technical diploma in culinary arts offered by ITE since April last year, in collaboration with the French school. All students need to make the two-week learning trip to Lyon. ITE subsidises the cost of the trip. The main takeaway from the overseas jaunt: that high-quality ingredients make a superior dish. To this end, the students attended seminars on seafood, cheese and wine, and visited farms and vineyards - including the one that produces the Beaujolais Nouveau brand of wine. Learning the basic blocks of what constitutes a dish also taught student Justin Michael Wee how to enrich the dining experience. "In France, they give you 10 possible answers with a lot of passion, each one more knowledgeable than the next." The students also tried their hand at a computer simulation exercise, where they thought like restaurateurs - planning menus and marketing their diner, while juggling tasks such as hiring staff and buying ingredients. 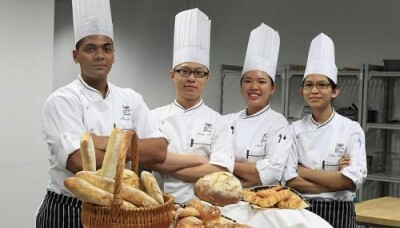 The diploma course was created to cater to the industry's "demand for specialised manpower", especially the many restaurants opened by French chefs who have ventured into Singapore, said an ITE spokesman. He said: "We hope to meet the needs of these aspiring restaurants, and at the same time provide our students with a good learning environment where they can grow their skills and develop a long-standing career in the culinary field, with French chefs as their mentors and coaches." Students learn to prepare recipes and operate in a kitchen during the 21/2-year diploma course, and also learn about menu planning, pricing and budgeting as well as controlling purchases and storage of ingredients. For a bigger perspective, they also learn to manage a team of kitchen staff and to promote a restaurant. But learning the art of cooking in France, for students who will most likely work in Singapore kitchens, poses some limitations, said Justin. For example, the French prefer their meat rare, while Singaporeans prefer it to be tender. Vegetables, on the other hand, are grilled soft for the French diner, while local tastebuds prefer crunchy greens. He said: "We still had to remind ourselves that when we come back to Singapore, it means cooking in a different way - we have to learn to be flexible."